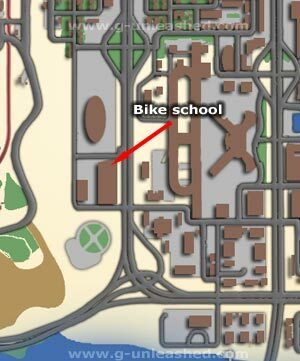 Here is a short guide about the 4 different schools in San Andreas. There is a bike, driving, pilot and boat school. Only the pilot school is necessary for 100%, but they all offer rewards for completing them. You will find the schools marked on the game menu map as an S. I have also made a small map to point out there locations. They are only available after completing certain missions, which will be covered in this guide. All the schools operate on a medals basis. Bronze, silver and gold. The better medals you get the better the reward. The table below outlines what percentage you need to get each medal. This guide goes over the locations, rewards and the first availability of each school. Chaos Energy has written another superb downloadable text guide on how to complete each school. Location: San Fierro, in the Doherty area. It's just a few blocks south of the garage CJ buys in the game missions. Unlocked: After completing the Deconstruction mission, which is one of the garage missions. Reward: Gives you more driving skill, unlocks the race tournaments and completes the mission 'Back to School'. 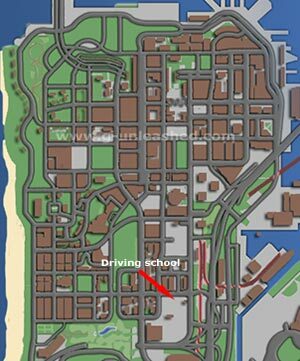 In addition to this, the medals you get determine what car spawns outside the driving school in the car park. At least all bronze gives you a Super GT. At least silver gives you a Bullet and at least gold gives you the Hotknife. Location:The west side of the desert in the little town, called Bayside, near the entrance of the Gant Bridge. 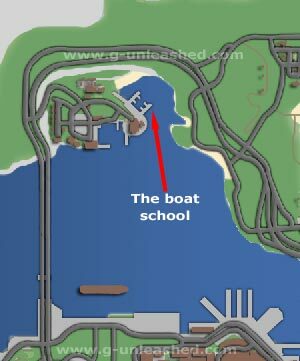 The school is the little hut at the end of the Marina. Unlocked: After completing Woozie's mission, Pier 69. Reward: What medals you get, determines what boat appears in the marina. Get at least all bronzes and a Marquis will appear. All silver and a Squallo appears. All gold and a Jetmax is yours. Location: Verdant Meadows Aircraft Graveyard in the desert. Unlocked: You must buy the Aircraft Graveyard which will cost you $80,000. It is also a required part of the main story missions. Reward: It's part of the main story missions so after completion you get $15,000, some respect and also a parachute everytime you jump out of a plane. You also recieve the pilot liscense which lets you get in an airport through the main gates. An airplane will spawn in the hanger to the west depending on which medals you get. Get at least bronzes and a Rustler will spawn. Get at least silvers and the stuntplane appears. All gold and the Hunter is yours. Location: Las Venturas, in the Blackfield area. It's directly south of the oval races stadium. Unlocked: As soon as you have access to Las Venturas. Reward: Your bike skill is upgraded. Once again the medals you get determine what bike appears outside. At least bronze gives you a Freeway. Silver, a FCR-900 and at all gold gives you the NRG-500. I have a little problem in boat school. Im tryin to get all gold and there is no problem except for the first test. How much i try to get the best time and even stops fast as possible i only get up to silver :/. Any tips? I'm still triying to get a stunt plane or at least a hunter in the fiying school because i already got a rustler but i stll don't know if it's acctually possible to change your record and another aircraft so can somebody help me with this. 2 things. Of which, one is strange. First , the not strange and happy moments one. I completed the flight school ALL GOLD. The hunter is is mine now and I did the police mission in it and they became so easy! Second, the strange one. 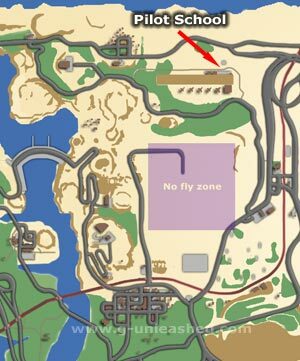 The desert airstripflight school is located so close to the "no fly zone"
do you need all gold in driving school for the huntley to spawn in the parking lot with the super gt and the bullet??? I can't complete the " Wheelie weave " test of the driving school (PC) . 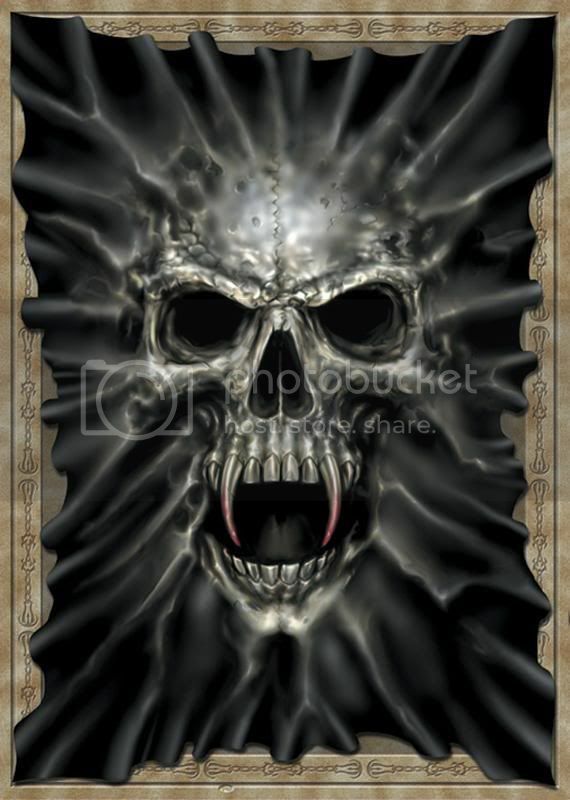 Any opinions ?